Looking for a lakefront summer cottage vacation rental? Whether short-term or long-term, we can help. Casual, personal service best describes Casazza Real Estate. I represent New Hampshire's beautiful Lake Winnipesaukee area exclusive lakefront and water access listings, and have access to all MLS listings. 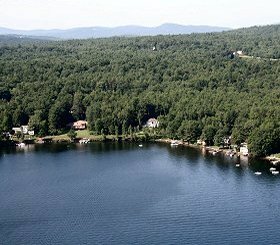 Our focus, service and dedication is in finding the "perfect Lakes Region property" for each and every client. We spend quality time with our clients and listen to their needs. Viewing a property by car, boat or air, in all types of weather and at different times of the day, ensures our clients end up with exactly the property they were looking for ... with no surprises. Let me help you find the perfect Lakes Region area lakefront or water access property or summer cottage. 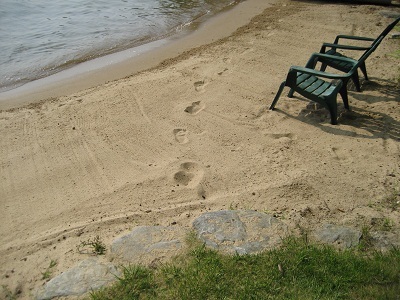 These could be your footprints - book your vacation cottage rental at Cozy Cove today!